Show your pastor, priest or other member of the ministry team that his or her dedication and faithfulness to God's cause do not go unnoticed! 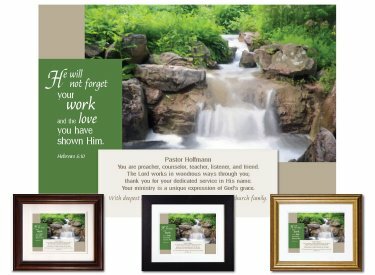 This keepsake features an excerpt from the Book of Hebrews: He will not forget your work and the love you have shown Him. Personalize it by adding the recipient's name and a special message (the final two italicized lines you see on the example). View another design based on this theme here.